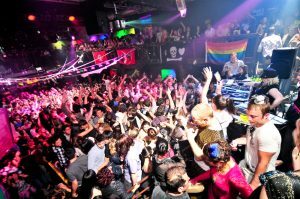 As the first and biggest mashup dance party in the world, Bootie Mashup has dedicated itself to the artform of the bootleg mashup. It now has regular parties in several cities, with various one-offs around the globe. Mashing up pop songs from every genre and era into one big dance party where everyone feels welcome, Bootie Mashup’s DJs (and SF mashup house band Smash-Up Derby) keep your brain guessing and body dancing with creative song combinations, celebrating — and satirizing — the many different forms of music. Bootie also presents the infamous Midnight Mashup Show, featuring drag and burlesque performers as well as singers, aerialists, and dance troupes. Bootie showcases the best mashup productions from around the world… because one song at a time just isn’t enough! So what’s a mashup? What’s a bootleg? It’s pretty much all the same. When the scene began to galvanize in the U.K. in the early ’00s, they were known as “bootlegs,” due to their illegal nature. Elsewhere in the world, they became known as “mashups.” Basically, this means the vocal track of one song is mixed over the instrumentation of another. Using audio editing software, DJs and mashup artists combine different artists and musical genres to create new and unique songs that are often greater than the sum of their parts. Imagine Lady Gaga rocking out with Nirvana, David Bowie crooning with Daft Punk, Madonna fronting Maroon 5, or Kanye West rapping with Beethoven, and many other unexpected combinations! Does the skull-and-crossbones in our logo mean anything to you? So where can I get these mashups? Since 99.999% of all mashups aren’t legally cleared by the artists, you can’t just go to a store and buy them. However, MP3s of these bootleg mixes are available all over the internet. 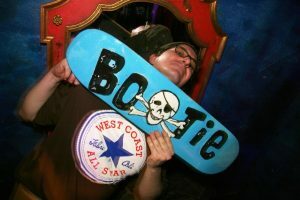 Click on some of the links: Bootie Top 10, Best of Bootie & Theme Albums to find some for yourself! Or, just come to a Bootie Mashup party!